A very hot sunny day greeted the 130 anglers in this the 10th Fish ‘O’ Mania qualifier at Barford Lakes, Norwich on Saturday 17th May 2014. The hot weather conditions didn’t put the fish off on the Match & Pleasure lakes, but unfortunately the offsite lakes at Railway and Willow, and Colton lake fished very hard.Kieron Rich an Angling Coach from Manchester made the long journey worthwhile. Daiwa backed Kieron drew peg 2 on the Match lake where he fished meat shallow on the long pole to take carp to12 lb throughout the day to finish with a superb 227 lb 1oz winning weight. 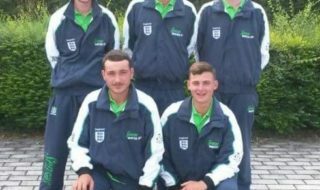 Kieron said it was a brilliant day and he was made up with his win. Runner up Chris Vandervliet (Drennan Bowlers Bait Tech) drew peg 7 on Pleasure lake where he caught carp, plus a few F1’s and tench fishing a 13 metre pole down the edge. 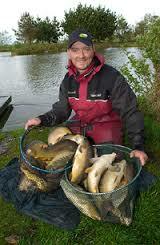 He fished worm and caster over groundbait for his 177 lbs 5 oz net, to include a big carp of 14 lb. 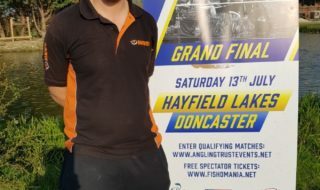 In third place was Ricky Young (Browning Hotrods) who fished worm and caster down the edge at peg 17 on Match lake where he recorded 173 lb 10 ozs. Gary Miller (Maver Image) finished in fourth place to weigh in 162 lbs 4 oz. from peg 30 on Match lake. He fished worm and caster down the margins for his mixed net of carp, F1’s and tench. 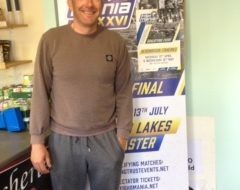 In fifth place it was a former Fish ‘O’ Mania Champion, Steve Jackson from Somerset who weighed in 154 lbs 11 ozs from Peg 10 on Pleasure lake, Steve’s biggest fish weighed in at 15 lb. With only six Fish ‘O’ Mania qualifiers left this year before the grand final takes place in July, the 11th qualifier moves to Colemans Cottage in Essex on Saturday 24th May.